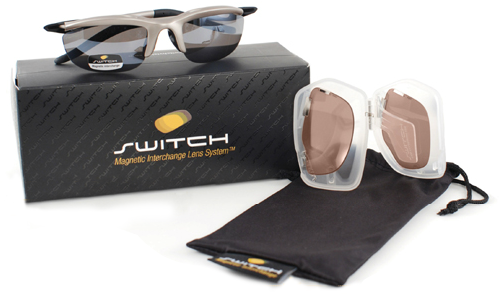 When conditions change, Switch lets you adapt instantly with the world’s first Magnetic Interchange Lens System™. Switch uses high-energy magnets embedded in the lens and frame that let you swap in the lens you need quickly and easily. These lenses practically jump into place, but stay put once they’ve snapped into position. And they’re engineered to stay in the frame when dropped from a height of six feet or subjected to the repeated jarring of skiing, snowboarding, running or mountain biking. So stop carrying around multiple pairs of bulky sunglasses. If you need Rx lenses one day but not the next, or if your day takes you through changing activities and light, Switch is the answer.